I have so many memories wrapped up in tomato salad, and they’re not all good. Well, not bad really, but my first introduction to this dish was not favorable. Actually, I hated it. When I was in my early teens, I spent several weeks, each August at the Jersey Shore with my aunt, uncle and cousins. 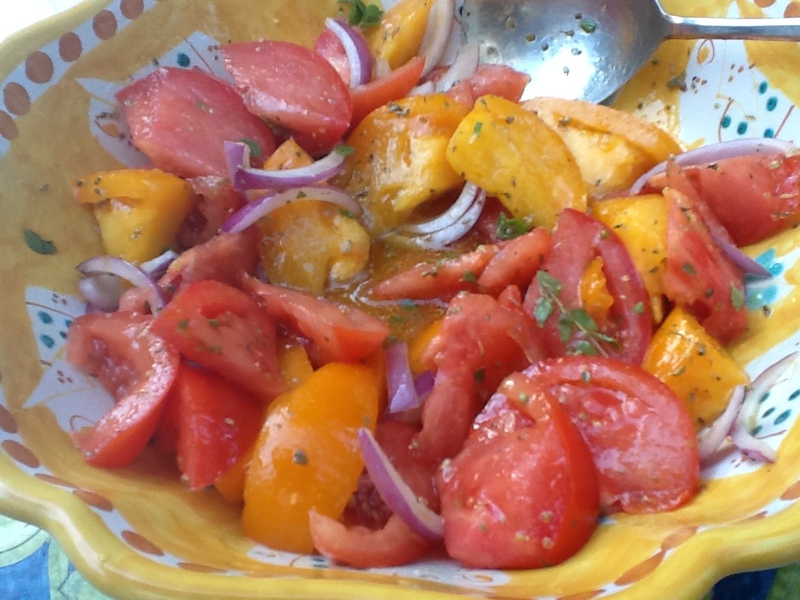 My aunt was a wonderful cook, but every night, my uncle insisted on cutting up those big, red, Jersey tomatoes and making a salad of the with red onions, olive oil, oregano, salt and pepper. Yuck! I could hardly swallow them. I liked my tomatoes cooked and over pasta! My uncle insisted that this was a very healthy way to eat tomatoes, so he would insist that I eat at least 2 pieces of tomatoes every night. It was torture, but if we wanted to go to the boardwalk after dinner, we had to eat the tomatoes. So I did. For these two weeks, every summer, I gagged on tomatoes at the dinner table, but made it to the boardwalk every night. This wasn’t anything that my mom made, so I didn’t have to encounter another tomato salad until the following year. Years passed, and I never ate another tomato in this manner. Sure, a slice of tomato on a sandwich was fine or in between two pieces of mozzarella, but not as a salad. Then one day, I was served this exact same salad, and actually liked it. Had tomatoes gotten tastier or had my tastebuds matured? I’m not sure, but now I love this salad so much, and look forward to buying Jersey tomatoes each summer at the farm stands. I find I obsess over summer tomatoes, just as I do corn on the cob. What would summer be without them? Because of this obsession with tomatoes, I change the salad nightly. Sometimes I make it with basil, oil and garlic. Sometimes I add cucumbers and bread chunks. But my favorite way is the way my Uncle Nino made it all those years ago. I think of him when I dive back into the bowl for well over 2 pieces of tomatoes. Isn’t there a saying, “tomatoes are wasted on the young?” Sorry, I think that actually was “youth is wasted on the young.” Well, that too. 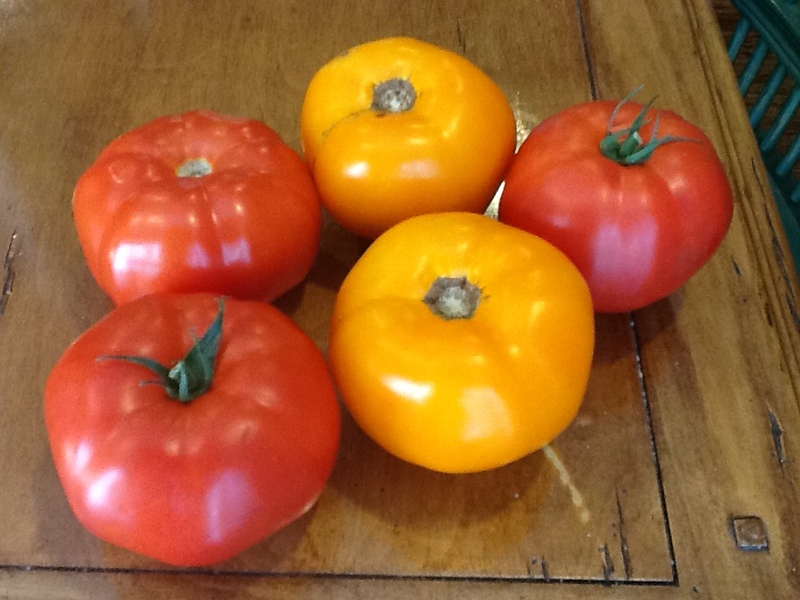 I’m going to share the recipes for my 3 favorite ways to prepare tomato salad. 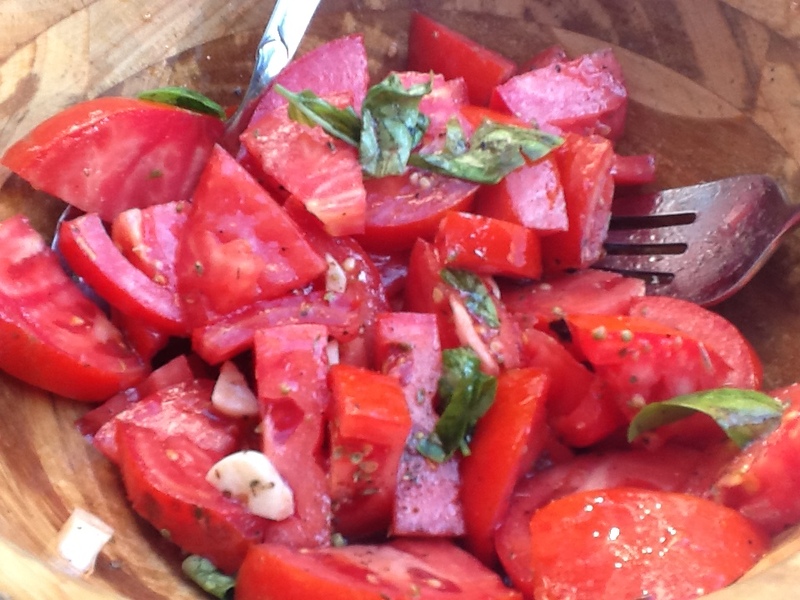 Hurry, before the summer tomatoes are gone and give it a try. Let me know which way is your favorite. I hope you don’t gag! Just kidding! 1. Cut tomatoes into bite size chunks. 2. Slice the onion, not too thin. 4. Pour olive oil over tomatoes and add the water. Mix well, adjusting seasonings. Tomato taste varies, so you may need to add more seasoning. 5. Sometimes I chill it in the fridge for half hour, but absolutely not necessary. This is what my uncle did, so this is what I do. 1. 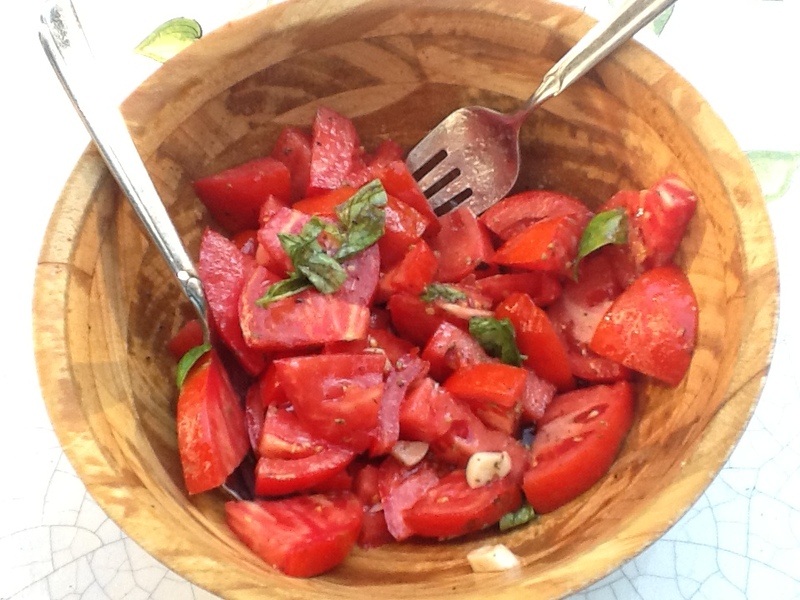 Combine tomatoes and garlic in a serving bowl. 2. Add the salt, pepper and olive oil. Mix well. 3. Add the basil and toss well. Adjust seasonings. 4. Let sit for 30 minutes before serving. Mix again before serving. 1. Combine all the ingredients in a serving bowl large enough to hold everything. Mix well. 2. Let stand for an hour or two, making sure the bread has absorbed all the liquid. 3. You can also put this in the refrigerator to chill for half hour, if you like. Summer is all about the amazing vegetables. My mom used to make a cooked salad using summer goodies like eggplant, peppers , celery and olives. It was called “sciabege” (not sure of how its spelled). She would boil them in water and vinegar for just a bit and then toss it with olive oil and garlic. And the longer it stayed (never too long) the better it got! That sounds delicious! I’m going to give “sciabege” a try.